3/1/2013 – WASHINGTON (AFNS) — As the Air Force braces for potential sequester, leadership has cancelled all aviation support to public events for at least the remainder of the fiscal year and is standing down the Thunderbirds aerial demonstration team to save flying hours to support readiness needs. 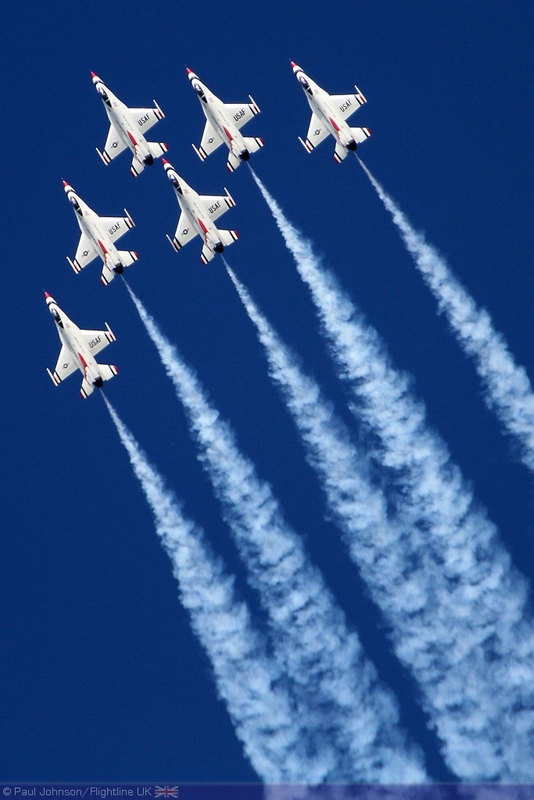 The Thunderbirds and Heritage Flight crews will complete their certification procedures for safely flying aerial demonstrations in case the budget allows resumption of scheduled events in 2013, but the Air Force will cease participation in Heritage flights following certification. “While we will protect flying operations in Afghanistan and other contingency areas, nuclear deterrence and initial flight training, roughly two-thirds of our active-duty combat Air Force units will curtail home station training,” said Chief of Staff Gen. Mark A. Welsh III.